The Cheltenham Park Hotel is set to become part of one of the UK’s top hotel brands, DoubleTree by Hilton under the management of M&T Hotel Management. Following an extensive £4.5m refurbishment the hotel will trade as DoubleTree by Hilton Cheltenham in March 2017. Situated in Charlton Kings, the property will become the first hotel in the Hilton portfolio of brands to open in Cheltenham. The hotel’s refurbishment includes all 148 bedrooms and the addition of three new upmarket suites. 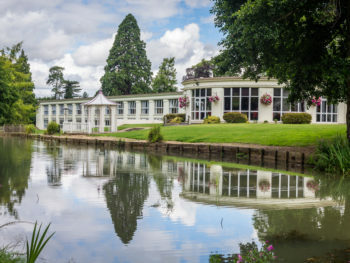 The hotel will also feature 520 square metres of refurbished event space including the Park Suite which caters for up to 320 guests and offers outstanding views over the Lilley Brook Lake and Golf Course, making it the ideal choice for conference and meetings organisers and large social occasions and weddings. Located in the picturesque Gloucestershire countryside, DoubleTree by Hilton Cheltenham will be surrounded by acres of parkland. It is situated, with less than two miles from the town centre and three miles from the world-famous Cheltenham racecourse. Guests will be able to relax in the newly refurbished leisure club which boasts state of the art equipment in the town’s largest hotel gym together with a 15m pool and four newly updated beauty therapy rooms. The public bars and Lilley Brook lounge will also undergo a complete transformation in the New Year and the hotel will also open a Starbucks in the lounge which will be operated by the hotel and be open to both guests and residents. For more information on the DoubleTree brand please visit news.doubletree.com or call the hotel on 01242 222021 or e-mail – cphreservations@cheltenhampark-hotel.co.uk.